This month, we had the pleasure of speaking with Pharmacy Manager Laura Moore from Mount Juliet, Tennessee. When she joined the Publix family in 2013, Laura immediately fell in love with Publix and the work culture. Laura shared, “Publix believes in respecting its associates, protecting the environment and keeping customers safe and satisfied.” As a firm believer that family comes first, she considers her customers extended family and loves the relationships she’s developed with them. Customers come to see Laura for recommendations and support because she works hard to provide premier customer service, while remembering Mr. George’s vision. Laura’s commitment and dedication to her associates is unmistakable. “They’re my backbone” she told us. “Without their daily support and commitment to my leadership and Publix, we couldn’t be a successful team. 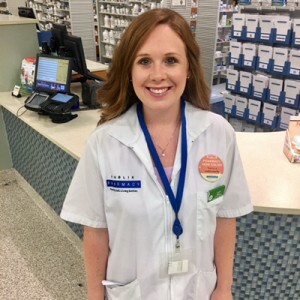 I’m so grateful to them for their hard work every day.” Her coworkers agree; they describe Laura as a hard worker who always tries to do the right thing, even in tough situations. When she’s not working, her favorite activities include traveling and spending time with her family on the lakes. During the summer before Pharmacy school, Laura spent several months traveling abroad. She visited Spain, England, France, Italy, Switzerland and Amsterdam with only one suitcase and one backpack. As an avid wake-boarder and wake-surfer, she’s determined to get her children to follow suit. She also loves playing tennis and is part of a Women’s League in Mount Juliet. It was Sunday near 8:00 p.m. and almost closing time for the Pharmacy. A customer, we’ll call him John, came in to pick up a prescription he had dropped off earlier for his son. That morning, his son had one tooth pulled and had an infection in a different tooth. John also had a tooth pulled that day. Upon returning home from picking up his prescription, he noticed the syringe for his son’s medication was in the bag but the medication was missing! When he realized this, it was 9:05 p.m. and the pharmacy had closed at 9:00 p.m. John called the store to speak to the Pharmacy hoping that somebody was still there. Laura picked up the call. John, who was relieved, explained the situation and then offered to drive back to the store to pick up the medication. Unfortunately for John, the Customer Service counter is not authorized to give out any prescriptions. At wit’s end, he gave up hope that he’d get the medication that night when Laura offered another option. Thinking of what she’d do if it was one of her own children, she offered to deliver the medication on her way home. It was an extra 30 minutes out of her way but she insisted. Nearly an hour later, John heard his doorbell ring. At the door stood Laura, medication in hand and a smile on her face. “Why would this stranger, someone I’ve never met, do this?” he asked us. Laura answered, out of the kindness of her heart, “It was the right thing to do.” We agree and are thankful for all Laura does. Have you ever witnessed an associate going above and beyond at your local Publix? Share your story with us on Facebook, Twitter, via our Contact Us page, or give our Customer Care team a call at (800) 242-1227. To read the stories of other recipients of the Mr. George Gold Coin, check them out here. Matthew L. started with Publix in 2009. After working his way up to a Publix Manager, Matthew decided to make a change from retail and pursue his passion for writing. Matthew enjoys hearing stories from the people he's writing about and loves the Publix culture. Outside of work, Matthew enjoys spending time with his wife and their dog, Edmund. They love to explore all that Central Florida has to offer. I have shopped at Publix for 50 years and met George Jenkins before and was very impressed. But the treatment and disrespect I was shown by the manager at the Silver Springs store in Ocala was disgraceful. I will never enter that store again. Never have I been treated that way. Hopefully I can still enjoy the other Publix in the area. I am sorry to hear about this. Can you please reach out to our Customer Care team on our contact us page at http://www.publix.com so we can help assist you further with this concern?